Yesterday it was Howard's and my anniversary and we went to the office Christmas party and Howard told the table that we had been married 30 years and people believed him! What did they think, that I got married when I was 13 or something? Did people not remember that just four years ago I was not married? Well, four years and two days ago I was not married. I was holding the rehearsal dinner that night, was what I was doing. That is a whole different story. Yesterday at the office Christmas party, which was at Chef's, there were first 11 people at our table, then I think we maxed out at 13 because we kept cramming people in. Not to brag but I was responsible for two big topics of conversation. One was Facebook. I was making people promise to be my friends so I do not look like this loser. The other topic of conversation was that eternal hit, Confession! Here is something to remember when you are in an awkward social situation and unsure what topics to discuss. Bring up Confession and you cannot go wrong. Everyone has a confession story. People start divulging how long it has been (years, usually) and what the priest said to them last time, and what they used to confess when they were kids. If the wine is flowing freely the odds go up that someone will start reciting his Act of Contrition. Is that an elegant name for a prayer or what? I never thought about it. After discussing Confession, we went to DiTondo's and drank jug wine. Well, I drank jug wine. Other people drank classier things. But I am unembarrassed! DiTondo's goes back to 1904 and my friend Toni Ruberto's family has owned it the entire time. And Toni tells me that her uncles and grandfathers and whoever, when they got together, all they drank was jug wine. DiTondo's is legend for its wonderful Italian food so what is good enough for these men is good enough for me. I have always gotten along well with Sicilian men which helps explain why Leonard Pennario put me in charge of his legacy. Wow, Pennario's performance of that Ravel. I binged on it yesterday, listening to it about three times, and now here I go again. Where was I? Oh, lastnight. Here is an appropriately blurry picture of me taking a picture of the jug wine at DiTondo's. Observe Toni's father, Mr. Ruberto, standing approvingly next to me. Also observe the poster about feeding the poor families. Later when Carlo Rossi had worked his magic, Toni had us all pitch in for a sweepstakes ticket for the Monsignor Nash Knights of Columbus. Note to out-of-towners: This is how charity is accomplished in Buffalo and has been for years. The tickets were $60 and the grand prize is $25,000. That is how big a deal this sweepstakes is. This morning we continue to revel in our civic connections. The paper today has a prominent story about Howard's downtown pal Don Yager who works for Homeland Security and is an adoption hero. He helps overseas orphans find homes with loving families. We happen to know that Don also helps pink flamingoes find homes with loving families! 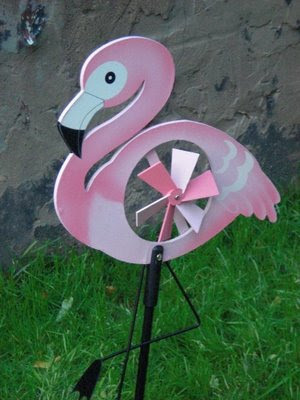 Remember that pink flamingo that turned up anonymously on the lawn at Big Blue? It turned out that was Don. He put it there. He bought it new, too, just for that purpose! But here is another thing that makes Don great, and that was not in the paper. He went on vacation to Cape Cod and found himself going around answering questions on adoption and helping people. He spent his whole vacation doing that! Most people do not want to do what they do for a living while they are on vacation. But Don got so much satisfaction out of that that he went back to the same place the next year, and did it all over again. Above is a picture of our pink flamingo from Don. And here is a picture of Don's business card that I found in Howard's wallet when I went in there looking for a twenty. Observe the coffee stain. Here is another business card in Howard's wallet. It is for Tom the hot dog man at the corner of Delaware and West Huron. Tom is a celebrity too. May viewing these treasures make you see your own wallet through new eyes! What rare business cards do you own? Business card: Essence Of Time, owned by Chuck Roeser of Lockport. He restores and installs weight and pendulum driven tower clocks...some in place, some relocated.